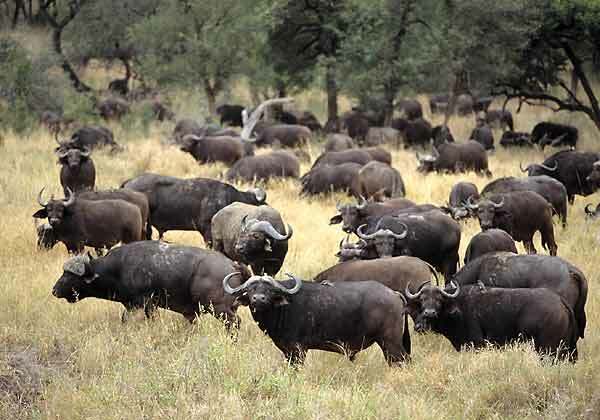 Caption: Buffalo herd grazing and milling about, Hluhluwe-Imfolozi Park, KwaZulu-Natal, South Africa. Photo: © Scotch Macaskill. Camera: Canon EOS 35mm film camera; Fuji Slide Film scanned with Nikon film scanner. Location: Hluhluwe-Imfolozi Park, covering some 96 000 ha, is an amalgamation of the former Hluhluwe and Umfolozi Game Reserves in KwaZulu-Natal province, South Africa.